“It’s enlightening and enriching to live and work in an international environment. As a person I have become more flexible and adopted an openness to different ways of working. 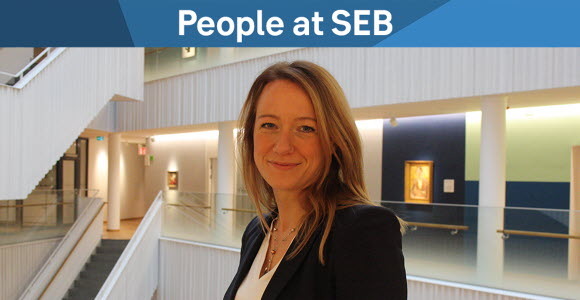 I can truly see the strength of listening and seeing things from different perspectives and approaches,” says Hanna Langwagen, who works with transformation management at SEB Kort and who previously worked in the Insurance division in Dublin. SEB is represented in 20 countries around the world and the bank aims to offer good opportunities to develop internationally to those who have that ambition. Hanna Langwagen is one of the employees who decided to spend a period abroad. Can you describe your international assignments at SEB? In connection with SEB’s acquisition of an Irish insurance company in 2011 I was given the opportunity together with my husband and two children, 6 and 8, to move to Dublin for work. My initial assignment entailed integration of the companies and the build-up of a business support function. My role evolved and after some time I became responsible for product and process development of SEB’s international Portfolio Bond offering. The entire family enjoyed Dublin, and the children had the opportunity to attend an English-speaking school. In the beginning it was a challenge, but they have benefited greatly from being bilingual. My husband, who works with IT at SEB, was able to work remotely. It’s a strength at SEB to be able to see the entire picture. What do you feel it has given you professionally and personally? It’s enlightening and enriching to live and work in an international environment – gaining insight into several parts of the business and learning to navigate in another culture. It was also insightful to learn how other markets work – everything from customer needs to legislation and distribution. As a person I have become more flexible and adopted an openness to different ways of working. I can truly see the strength of listening and seeing things from different perspectives and approaches. Last, but not least, it is fun to work in a smaller organisation for some time – there’s a special kinship and speed from decision to delivery. Do you want to become a part of SEB’s team? Take a look at our open vacancies to see if we have a position that would fit you.